In 1824 the British government enacted the Judicature Act which created the first land registration system in the province. The system was based on a District Court model with a Northern District Court in Harbour Grace, a Southern District Court in Ferryland and a Central District Court in St. John's. All deeds, wills, grants and other instruments were required to be registered in the respective District Court within six months. Poor transportation and communication systems, however, prevented the public from meeting this six month deadline, causing the legislature to remove the requirement for compulsory registration. Compulsory registration was never again re-introduced. As a result, many individuals throughout the province continue to hold land by means of unregistered deeds or Squatter's Rights. Squatter's rights, also known as adverse possession is part of common law and it refers to an individual possessing land in an "open, notorious, continuous and exclusive fashion without the owner's consent for a period of 10 consecutive years." Adverse Possession against the Crown was abolished on January 1, 1977. However, any Crown land that was held by an individual for 20 continuous years or more prior to January 1, 1977 is recognized. If you meet the requirements mentioned, you are entitled to apply to the Crown for a grant. This grant, if approved, would come under Section 36 (Squatter's Rights). To ensure good title to unregistered land (any land that has never been granted) you will require the services of a lawyer and a surveyor. The surveyor will not only outline the exact boundaries and quantity of land you possess. But he/she will also indicate any encroachments, easements, right of ways, and structures etc; which affect the property, together with names and registry data (if available) of bounding properties. 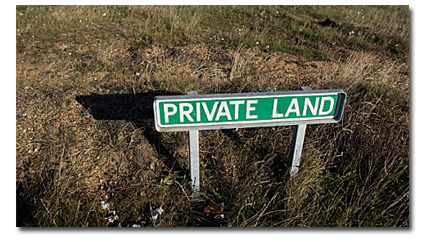 The lawyer on the other hand will determine the quality of the title you have to your particular parcel of land. A good lawyer will want a full history of how you obtained and used the property. He/she will also do a thorough title search of both the registry of deeds and the Crown land registry, where applicable. (Note: a title search is mandatory). A lawyer will not certify title to a property unless he/she is satisfied with the root of title. And this root of title can only be obtained by doing a title search. Be prepared to spend months (sometimes years) if you are trying to get good title to land that has never been registered, particularly in today's environment. In some instances, you may be advised to Quiet the Title. Note: When requesting the services of a surveyor or a lawyer, make certain you hire someone who has a good knowledge of land issues. Remember, you only get what you pay for.